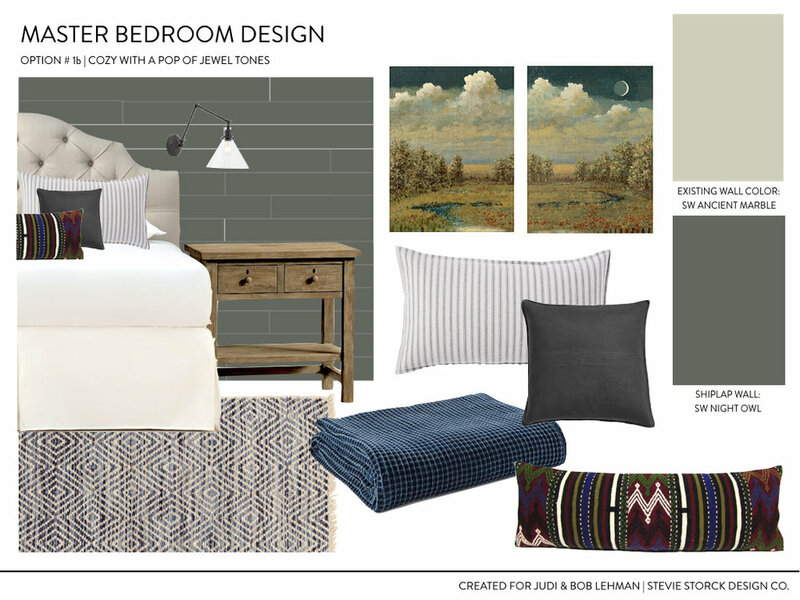 Bridgeton Project | Master Bedroom Design Process — Stevie Storck Design Co.
You know that feeling where you have to keep pinching yourself, asking "is this real life"? That's the feeling I've had working with my clients Judi & Bob on their master bedroom makeover these last few months. Judi & Bob are seriously DREAM clients! They live in the southern end of the county where I grew up, and they love a "classed-up" take on rustic, country style. When we met for our first consultation back in November, they were waiting to close on their forever home- a beautiful ranch style house with gorgeous hill-top views out front and pretty woods behind. From the beginning, they said they wanted their master bedroom to feel like a boutique hotel. Although they'd lived in their last home for many years, they never took the time to really create a retreat for themselves by decorating their master bedroom. Did I mention Judi & Bob are two of the nicest people I've ever met? They certainly deserved a cozy, comfortable and beautiful space to enjoy in their new house, just for the two of them. It's a good size space with a large closet and en suite bathroom. The carpet had been recently replaced and the walls were painted a nice soft green that they wanted to keep. Whereas the previous homeowner's style was feminine and pretty, we wanted to go for something a little more rustic with balanced masculine and feminine elements. I presented a series of Mood Boards for Judi & Bob to consider. Bob is a very skilled carpenter and had already decided he would be making their nightstands and dressers. At our first consultation, I made some suggestions for the finish and a complimentary bed style that they really liked. So with the Mood Boards, I focused on illustrating two (and a half!) different feels that we could create for the room. One more high contrast with a dark shiplap accent wall and one lighter and airier with a classic striped wallpaper. Judi & Bob both agreed on Option #1a right away! I love all the Mood Boards I created, but I have to admit that one was my favorite too. After getting the go ahead, I set about selecting the rest of the furniture, fixtures and accessories we would need to complete the room and created their Final Design boards and drawings. Here's the elevation sketch I did of the focal wall of the room to confirm the width of the shiplap feature wall (which was actually tongue-and-groove panels handmade and finished by Bob!) and placement of the artwork and wall sconces. If the last few pieces arrive on time, I should have reveal photos to share by early summer! What do you think of the design they chose? Sign up with your email address to receive news and updates from Stevie Storck Design Co.!